There has never been a better time for banks to take a 360-degree view of their customers. The trend is heading towards offering a “segment of one”. A personalized experience where the user receives the right offer at the right time. With legal restrictions and internal policies, it’s much more difficult to take full advantage of the benefits that collecting data brings. The marketing areas of websites and applications are usually analyzed with the use of common solutions like Google Analytics or Adobe Analytics. The situation gets tougher when you collect data from the pages available after logging in, known as secure member areas. The data processed there often contains PFI (personal financial information), the use of which is regulated by a number of sectoral laws – including the MOBILE Act and PSD2 (Payment Services Directive 2). This makes the use of popular tools with third-party scripts (like GA) extremely risky. How to Handle Marketing Data the Right Way in Banking Industry? What makes this data useful? 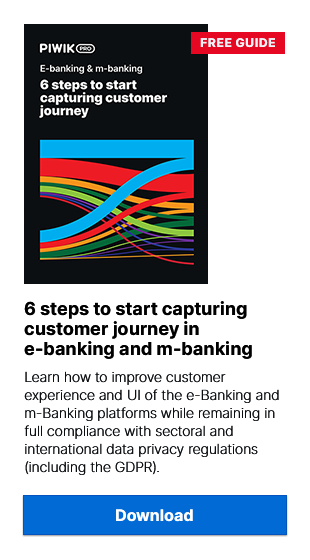 It’s where users perform the most important activities from the bank’s standpoint. This is where their true preferences show up. The data is ready to be pulled from transactional pages to allow banks to prepare better, more customized offers and increase customer satisfaction. Combining data across marketing and secure areas of the website gives us the full customer journey. Let’s take a closer look at these options and analyze their advantages and disadvantages. This basically means that you use your own or outsourced workforce to code the solution from scratch. You’ll get exactly what you asked for. This type of approach will require commitment on your part throughout the entire development of the product. The first and quite popular choice is to build a simple web analytics tool stored on your own premises. This tool will allow you to track users’ behavior, as it would be tailored to your specifications. As an alternative, you could take a pre-existing open source analytics tool (like Matomo or Open Web Analytics) and adapt it to your specific needs. The biggest advantage of this solution is that you’re working with a team employed directly by your company. Therefore, designers and developers involved in the project feel high responsibility for its success. The tool will be a direct translation of your needs into an analytics system. It will be created based on your guidelines and business objectives. Going for your own tool means you can implement all the privacy settings necessary to comply with the relevant regulations. This is especially true if achieving full data privacy compliance is problematic when using an off-the-shelf tool. Also, ownership of technology and data, rather than using a third-party solution, gives the advantage of intellectual rights ownership, better adaptability and compliance with privacy regulations. Companies assume that the expertise of their own IT team will help them create software that fits their market. After all, IT teams in banks have a high awareness of the banks’ limitations arising from laws and internal policies. However, fluency in web analytics software development is a completely different thing. Keep in mind that developers must dedicate significant time to learning, creating and maintaining a technology. This technology is merely an addition to the bank’s core business. Unless your team has experience in custom analytics platforms, there’s a chance that the outcome of their work might be simplistic and limited. Integrations and user friendliness can be particularly problematic. Another thing is the need for continuous business engagement and commercial support to avoid detachment. Building your own tool might seem like a project for the technologically savvy, but ongoing business engagement is of equal if not greater importance. Acquiring the technology and expertise necessary to develop such a tool can be quite an expensive endeavour. Rolling out and developing a platform is one thing, but ongoing maintenance and operation also involves costs. This can lead to a situation in which you will have to expand your IT team. And as you surely know, hiring developers directly is a lengthy and costly experience for any company. The average time it takes to recruit a new developer is 43 days, and involves extensive productivity losses. You can reduce the cost and time of the exercise with the help of outsourcing. However, in this case, the expertise of the crew people and your impact on their work can be considerably lower. A development partner is a company that specializes in a particular area of software development – in this case, web analytics. They typically provide full-service development as well as a dedicated team of specialists, including designers, project managers, DevOps, developers, QA and testing specialists. One of the most popular software houses creating analytical systems is our sister company, Clearcode. Because of specialization, the quality of the product is going to be a lot higher compared to the quality produced by inexperienced developers, regardless of whether they are in-house or outsourced. What’s more, it can be designed to meet every requirement outlined in the evaluation phase. Rather than just labeling something ‘Nice to Have’, you can have it. Custom software can be modified and expanded, keeping in step with your business as technology and your business itself develops and changes over the years. A development partner will have all the required resources needed to manage the entire technical side of the project. You can focus on building your business and onboarding new clients. Like anything that is customized, a custom solution will cost much more than an off-the-shelf product. For companies operating on a limited marketing budget, the price may turn out to be an insurmountable obstacle. Another option is to use ready-made solutions. They will not be 100% tailored to your needs, but they will allow you to limit or completely free yourself from developing your tool in-house. Also, unlike custom platforms, they won’t require such a large up-front investment. Instead of developing software on their own, banks can buy ready-made tools and develop integrations between them. The cost of building such a system is much lower than developing software from scratch. Still, your internal team has to manage integration between the tools to connect the data. This means you have to bear some costs associated with internal development and maintenance. You’re able to put the solution to work almost immediately after you develop the integration between modules. Also, technical differences might cause a problem with unifying the data into a single structured set. Thus, the platform won’t deliver the high-quality data necessary to connect the dots across the stages of the customer journey. Not to mention that using two different tools can lead to data discrepancies. Another option is ready-made analytics. You should look for web analytics vendors offering on-premises storage options and features for enhanced data security. Those might be difficult to find, since most analytics tools operate in a cloud environment. That automatically rules out running their software on a bank’s domain. Piwik PRO Analytics Suite, however, unlike most of the web analytics tools available on the market, ticks all those boxes. Let’s see what you’ll be able to achieve with a product whose roadmap is shaped by the needs of the financial industry. By opting for ready-made solutions, you save time. The tool will be ready to use right after you install and configure it. The license for an on-premises solution is a fixed, recurring cost. But in most cases, developing in-house or hiring a specialized agency is way more expensive. Since you use a dedicated tool for handling both marketing pages and post-login areas, you won’t have to worry about data integration. You gain access to high-quality, granular data about your clients. You will be able to gather all information about users in one place, faithfully recreate their customer journey and create a single customer view. With its API, analytics easily connects with other solutions in your stack, meaning you’ll be able to combine analytics data with information from transactional or CRM systems. Also, you can export this data to BI tools or create audiences for on-site retargeting campaigns. Piwik PRO Analytics Suite consists of several products, including On-Site Retargeting. All of them are tailored to the needs and limitations of banks. The tool will allow you to safely use the data about your visitors to make website content more appealing to their interests. In the case of enterprise-level analytics software, most of the tasks related to keeping the platform up and running will be handled by the vendor. Premium user training and Customer Success Program – a dedicated Customer Success Manager that will assist you in defining your needs and translating them into actionable advice for using the platform. Detailed documentation – detailed infrastructure guidelines to ensure optimal product performance in the case of an on-premises installation. Enterprise support and onboarding – configuration of your web analytics instance, including an SLA ensuring all your needs are met as when using the product. Such services can be provided on-site in cooperation with your internal team. Dedicated technical project coordinator – a first point of contact in case of emergencies or web analytics performance issues. Last but not least – data security. With Piwik PRO you’ll get to choose the safest data storage option (on-premise or private cloud), receive 100% data ownership, full access control, two-factor authentication, single sign-on and audit logs. Also, you’ll have access to detailed logs of all activity within the platform and manage all analytics users in a central database. The tool will also help you comply with data privacy laws (including GDPR) and, if necessary, ensure the highest data anonymization standards. There’s a risk that the software will not be adapted to your needs. The more specific those needs are, the greater the chance for this problem to occur. Also, the vendor can react slowly to legal changes affecting your industry. However, when it comes to Piwik PRO, a company with over 50 finance and banking clients on board, these issues are limited to a minimum. The product’s roadmap takes into account the unique demands of the banking and finance industry. In addition, it provides a way to adapt the tool to the requirements of specific clients – for example, by creating dedicated codes in Tag Manager (also a part of our Analytics Suite). Off the shelf or build your own – which solution is right for you? We realize that your final decision will depend on many factors, and some of them may not have been included in our list. Still, we hope that we’ve managed to dispel at least some of your doubts related to choosing web analytics for banking. Also, we wanted to show that – despite the stereotypes – there are ready-made solutions that can keep up with your strict sectoral requirements. If you would like to learn more about how Piwik PRO Analytics Suite responds to the needs of banks and financial institutions, be sure to contact us!